A low-glare polyester film with an ultra low-melt adhesive system and UV inhibitors. 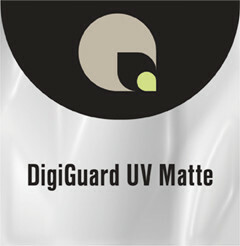 For pop-ups and displays -- from ink jet, plain paper, and photographic prints -- DigiGuard UV Matte provides the flexibility of single- or double-sided application while eliminating light transference and reflection. It also adds rigidity and protection from abrasions, moisture, oils, and dirt. When images are ink jet printed, our Quality Satin Paper and Ink Jet Coated Media have been specially designed to work with DigiGuard UV Matte for superior end results.